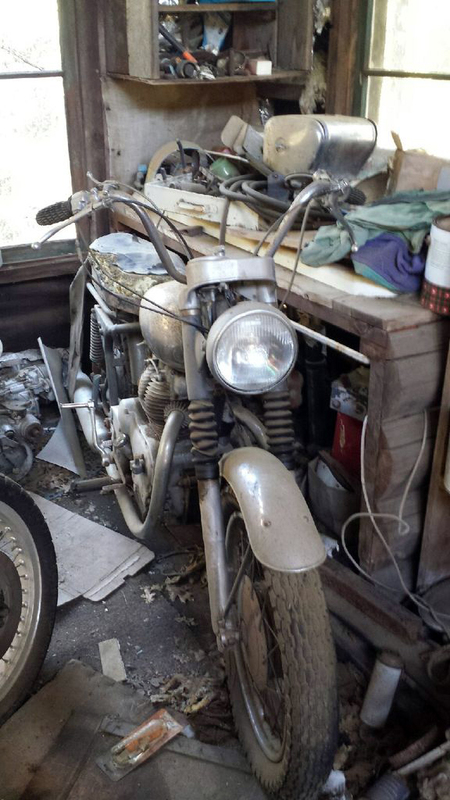 Russ Hudson was lucky to find this proud Royal Enfield Interceptor. And then he found another one. 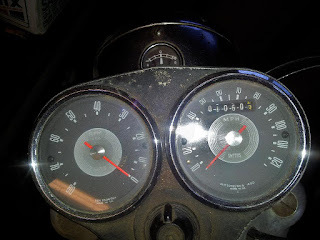 In January, 2014, Northern California motorcycle enthusiast Russ Hudson turned to the members of the Royal Enfield Forum on BritBike.com for help. He had just purchased a Royal Enfield Interceptor on an impulse. Russ was not even sure what year Interceptor it was. 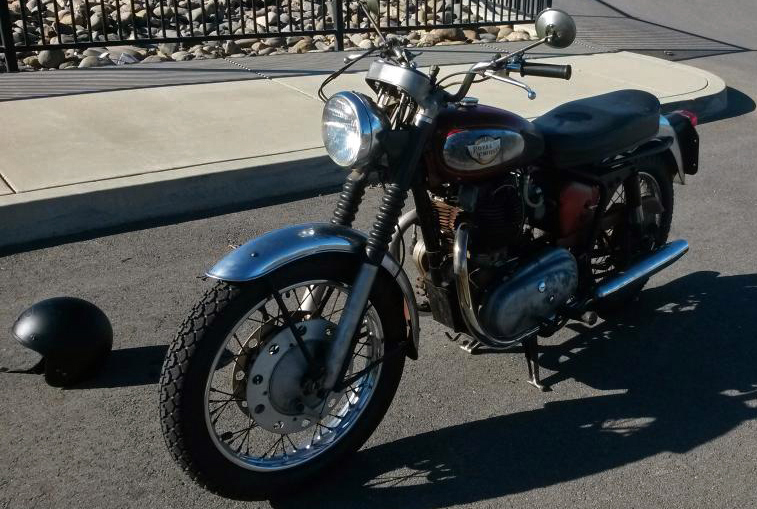 "I saw a CraigsList ad for a BSA Trident and a 'Royal Enfield' and went to take a look, excited about a possible Rocket 3. Went to the guy's house (out in the woods by Mount Lassen here in Northern California, in a town called Viola) and lo and behold there is an original 69 Rocket 3! "Next to it was the Interceptor, covered in sawdust. I was thrilled about the BSA and bought it immediately, loaded it up and hauled it home. That night I kept thinking about that poor Royal Enfield still sitting up there in the shed. The next day I drove back up there and bought it." A squirrel had used the Interceptor to store stolen dog food. The tires were flat, and a squirrel had hidden dog food in one of the mufflers. But it wasn't long before Russ found himself the envy of forum members. The "Shell Mtrs" license frame is something special. His Interceptor showed low mileage. It also sported a "Shell Motors, Lynwood" license plate frame, identifying it as having passed through the storied California dealership of Shell Thuet, motorcycle racing tuner and sponsor. Odometer reading: "Can't think of any reason this isn't correct, " Russ said. Inside the frame was an original black and yellow California license plate. 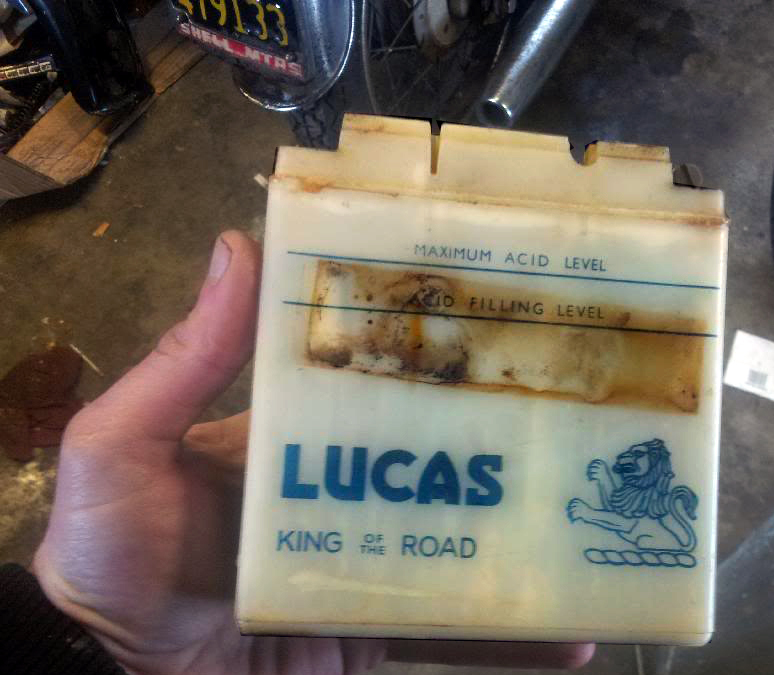 Even the old Lucas battery is "a museum piece," member Chris Overton commented. The old battery evokes memories. Russ began putting his Interceptor right, with the help of advice from forum members. "Hey guys, I got a lead on an Interceptor out in the woods maybe 60 miles from my house, so I went out and picked it up on Saturday. Got it home, and would you believe that the frame number is consecutive to the Interceptor I bought a few years ago? 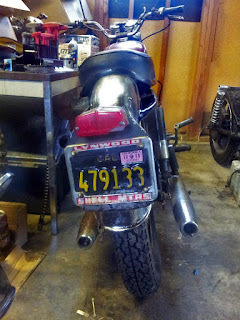 "The Interceptor from a couple years ago is frame number 73155, and this one from last weekend is 73156. Is this as crazy as I think it is?" 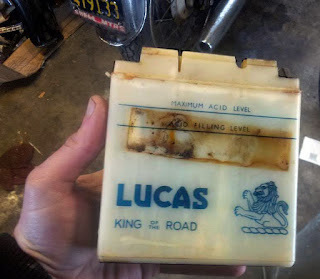 Russ's second Interceptor find has the next-in-line frame number. Members theorized that the original dealer had received consecutive machines. But that requires the further coincidence of two rare Interceptors ending up close to Russ. "I don't know why I've found two of these bikes around here, I'm a long way from Shell Motors," Russ told the forum. "This latest Interceptor has a BSA angle as well," Russ told me. "I have a client who I learned had a 1966 BSA Hornet (he was the original owner, and an old hippy). I wanted the bike bad but he wasn't ready to sell. He told me that I had first chance when he decided to sell it. I called him every year around Christmas for five years or so see if he was ready to sell. The last time I called he told me regretfully that he had given the Hornet to his nephew. "He came to my office and saw all of my Interceptor ads on the wall. He then went to work on one of his hippy friends who he remembered had a Royal Enfield. He got the OK to give me the friend's number, and a couple months later I called and went up to see it. 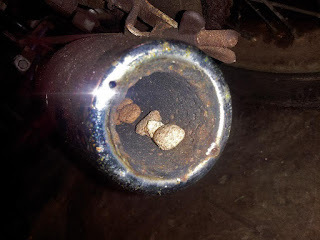 "There it was as shown in the pictures in one of the outbuildings at this neo-hippy commune outside of Hayfork, Calif. A thousand dollars later it was in the truck. Took it home, checked the numbers and that's the story!" What are the odds? Regardless of the numbers, "you must be doing something right to get a lead on another Interceptor," Chris Overton commented on the forum. Nice find! Now get to work. Show Sid and Rod from Eicher Group you can put an Interceptor on the street before they do. Good luck and best wishes. Attaboy! Put up some pix so we can get jealous.